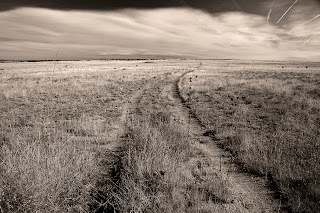 Deep ruts cut through dry grass toward the low hills near Cline's Corner. One conjures images of prairie schooners and hardy pioneer folk crossing the prairie to the promise of a better life. You have made photographing the broad landscape (with the lower third of the image the earth and the remainder the sky) into a very fine science. This is another stunning example of that! Thanks Daryl. Let's get together soon.